“IADC is pleased with today’s CBP notice. The now-withdrawn proposal offered a new interpretation of decades-old customs rulings and created uncertainty by potentially reclassifying as “merchandise” much of the drilling equipment used in the U.S. Gulf of Mexico. IADC partnered with other industry associations to submit comments to CBP, along with a separate stand-alone comment letter because we believed that the proposed modifications would erect a significant obstacle to the work of offshore drilling contractors. Thus, we thank CBP for its careful consideration of all submitted comments and look forward to working with the agency as an educative resource on this matter and all others pertaining to the offshore drilling industry. On 25 May, IADC hosted an educational event for Capitol Hill staffers entitled, “IADC Offshore Drilling Rigs 101”. Several offshore IADC members led a discussion on the role of drilling contractors in the well construction process and presented safety data, along with the latest in high-tech drilling rigs during the event. Brady Long, Senior Vice President and General Counsel; Transocean Ltd.
Chris Johnston, Vice President of North and South America; ENSCO plc. James Sanislow, Vice President and Chief Compliance Officer; Noble Drilling Services Inc.
Lyndol Dew, Senior Vice President of Worldwide Operations; Diamond Offshore Drilling Inc. Along with the educational event, offshore members met with U.S. Environmental Protection Agency (EPA) Administrator Scott Pruitt, along with several Senators and Members of Congress representing Mississippi, Texas, Georgia, North Carolina, Louisiana, Virginia, New Jersey, Florida, Alaska and Alabama. On 12 May, several Houston-based members of IADC met with U.S. 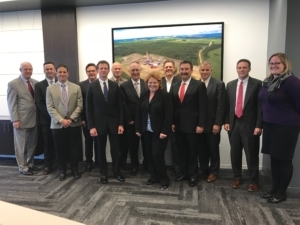 Senator Heidi Heitkamp of North Dakota to discuss issues of interest to the U.S. oil and gas industry. From Left: Bob Warren, IADC; Jason McFarland, IADC; Jim Rocco, IADC; Tony Seeliger, Pacific Drilling; Mike Lawson, Rowan; Mike Bowie, GE Oil & Gas; Lyndol Dew, Diamond Offshore Drilling; Senator Heitkamp; Paul Mosvold, Scandrill, Inc.; Mike Garvin, Patterson-UTI Drilling Company; Mike Holcomb, Patterson-UTI; Mike Drickamer, Patterson-UTI Drilling Company; Hilary Burden, Patterson-UTI Drilling Company. After the President’s “America-First Offshore Energy Strategy” Executive Order (EO) was issued in late April, Interior Secretary Zinke issued Secretarial orders 3350 and 3351. Order 3350 implements the President’s EO by issuing a strategy for re-evaluating BOEM’s five-year OCS leasing program, aka the five-year plan, BSEE’s final rule on Oil and Gas Sulfur Operations in the Outer Continental Shelf-Blowout Preventer Systems and Well Control, and expediting consideration of permits for seismic surveys, among other things. Order 3351 establishes a new position at the Department of Interior – Counselor to the Secretary for Energy Policy, to ensure deliberate and active coordination of energy policy in the Department. IADC senior leadership and offshore members participating in the Washington, D.C. fly-in met the new Counselor – Vincent Devito – to discuss issues of importance to offshore drilling contractors. The House of Representatives passed H.R. 1628, the American Health Care Act, which repeals and replaces the Affordable Health Care Act (aka Obamacare). That legislation has been sent to the U.S. Senate for consideration. The House Way and Means Committee also began hearings on tax reform, most notably, they held a hearing on the Border Adjustment Tax. The U.S. Senate processed about a dozen various nominations during the month of May. On 4 May in Houston, IADC and the Brazil Institute of Petroleum, Gas and Biofuels (IBP) signed a memorandum of understanding (MOU), which establishes a framework through which the organizations will cooperate and collaborate to foster education and communication within the upstream oil and gas industry in Brazil. 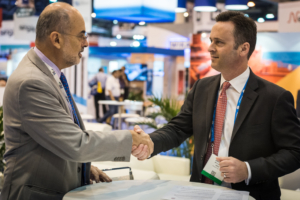 The MOU was signed by IADC President Jason McFarland and Milton Costa Filho, IBP Secretary-General during the 2017 Offshore Technology Conference. IBP Secretary-General Milton Costa Filho (left) and IADC President Jason McFarland sign the MOU on 4 May. Two new members have been named to the Well Control Institute Board of Directors. Steve Brady, Senior VP – Eastern Hemisphere for Ensco plc. and current IADC Vice-Chairman, was named to fill the contractor vacancy created when Lyndol Dew of Diamond Offshore was confirmed as WCI Chairman. Additionally, Eric Daflon, Vice President – Drilling & Wells for Total S.A., was appointed to fill an operator position previously filled by Dawood Al-Dawood of Saudi Aramco. These new Board members have been approved by IADC’s Executive Committee and also by the full WCI Board. WCI operates under the auspices of IADC to ensure that operators, contractors, equipment manufacturers, and service providers have a forum to provide oversight and leadership on key well control initiatives. The WCI Board brings together drilling industry leaders from all sectors of the industry to develop comprehensive solutions needed to significantly improve well control performance worldwide. On 3 May, students from Missouri University of Science and Technology visited IADC’s Houston office. 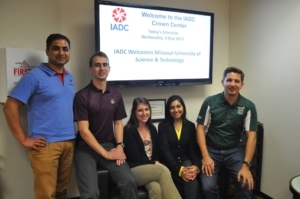 The students had an opportunity to speak with IADC leadership to gain a better understanding of the association’s role in the drilling industry and how students can become involved in the future of the organization. Missouri University of Science and Technology students. From left: Usama bin Rehman, Connor Kirtley, Alyssa Snider, Elizabeth Sotolongo and Colin Woolums. The Drilling Systems Automation (DSA) Roadmap Industry initiative began in 2013 to describe the anticipated path of drilling systems automation to 2025. Led by John de Wardt as Program Manager, it has a strong steering committee of 16 experts covering a broad range of knowledge including rig design, human systems integration, modeling, robotics, sensors, data transmission, systems engineering including a portfolio of brand name companies. This first of a kind drilling initiative was initially an all-volunteer program and has gathered input from some 50 industry experts. The DSA Roadmap has discovered some key aspects that will impact the uptake of Drilling Systems Automation. There are many forks in the road ahead opening the debate as to which route the drilling industry will take. Will interoperability prevail over proprietary systems or vice versa, will downhole to surface telemetry data rates rise or continue as a dichotomy between mud pulse and similar systems versus hard wire, will the industry adopt an industry Reference Architecture to enable interoperability and finally, will asset replacement occur or will the previous designs prevail as the basis for automation. A section of the roadmap is devoted to articulating the value proposition of each, which so far seems to have eluded the industry in terms of a comprehensive application of automation. The IADC Drilling Engineering Committee endorsed the funding of a Joint Industry Project (JIP) to accelerate delivery of the Phase II Stage I draft report. This 247-page document was presented to the 10 JIP funders in early April at a seminar in Houston. The funders positive feedback opened the door to the next stage of the DSA Roadmap report which will become the first issued to the industry. 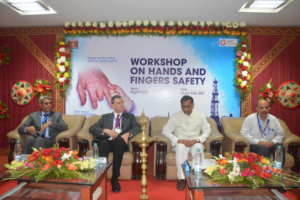 On 25 March, the IADC South Central Asia Chapter hosted a Hand & Finger Safety Workshop in Agartala, India. The workshop was organized to bring awareness to hand and finger injuries, which according to IADC Incident Statistics Report data, comprise more than 43 percent of all recordable incidents on drilling rigs. Those who attended the conference were divided into 9 groups and each was given a safety case to examine to determine key preventative measures. Drilling Contractor Magazine will host a Virtual Panel Discussion (VPD), “Examining Gateway, IADC’s Training Program for New Employees”, on 27 June. The pre-recorded VPD will feature a discussion by three seasoned drilling-industry learning and development professionals. The drilling industry faces a unique challenge today when it comes to recruiting the right people for the right roles, just as the industry is beginning to recover. Demand for workers with a higher level of technical skills is increasing, just as an entire generation of veteran employees retires. The modern drilling workforce must train to fill these roles, as well as develop the next generation of operations and technology. Presenters for this VPD include Pamela Wakefield, Director of Training, Patterson-UTI; Linda Head, Associate Vice Chancellor of Workforce Education and Corporate Sponsorship, Lone Star College; and Brooke Polk, Director – Program Development & Technology, IADC. The discussion will be moderated by Mike Killalea, Group VP/Publisher, IADC and DrillingContractor.org. To pre-register for the VPD, please visit the DrillingContractor.org website. 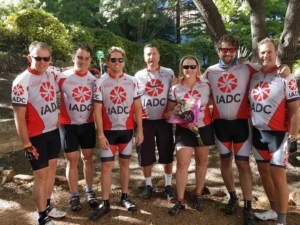 In early May, the IADC Riding Team participated in the BP MS 150, biking from Houston to Austin in two days in support of finding a cure for MS.
From Left: Mark Denkowski, IADC; Jim Rocco, IADC; Casey Billman, Austin-based technology company; Jaime Brito, Consultant; Storri Wild, H&P; Andrew Gordon; Scott Gordon, Helmerich & Payne. In 2016, much of the oil and gas industry, like other major industries, observed an uptick in cyber threats, ranging from ransomware to remote access Trojans. In response, The Oil and Natural Gas Information Sharing and Analysis Center (ONG-ISAC), a non-profit, was created by the oil and gas industry to support its members through the analysis and exchange of cyber threat intelligence for mutual defense. Its dozens of members, which include IADC, include some of the largest multinational companies in the world, as well as small and medium enterprises committed to security. Last year, ONG-ISAC shared more than 1,450 ONG-specific alerts and vulnerability advisories. Information passing through ONG-ISAC ranged from advanced persistent threats, targeted attacks and sandbox results on malware packages, to thefts by regional organized crime and activities of global terrorist groups. The ONG-ISAC’s sources include submissions by members, government agencies and other trusted partners, and it functions as a “neighborhood watch” for the oil and gas industry, saving companies on security cleanup and preventing loss of IP and financial details. As malicious actors increasingly share information on the dark web, so too should members of the industry. The week of June 12-18, the Occupational Safety and Health Administration (OSHA) will host it’s inaugural Safe+Sound Week to raise awareness and understanding of the value of safety and health programs in the workplace. Organizations of any size in any industry are encouraged to participate. Via it’s website, OSHA has offered examples of potential activities and tools to help companies plan Safe+Sound Week activities. To learn more about how your company can participate, and to view Safe+Sound events already planned, visit the OSHA website. The IADC DEC Committee will host a Technology Forum on 14 June in Houston, “Making Data Actionable: Operators Perspective”. Contemporary hydrocarbon drilling operations generate numerous streams of data in various formats. These data streams might be generated by the operator, drilling contractor, service companies or equipment manufacturers. Today’s driller is challenged to prioritize data sources, convert data to useful information and take appropriate actions to maximize drilling productivity, maintain well integrity and protect personnel, property and the environment. The ability acquire and interpret data in real time is playing an increasingly significant role in maximizing asset ROI. To avoid “boiling the ocean”, the committee has adopted the operator perspective, with a view that improving cost and efficiency is beneficial for all industry stakeholders. The presentations selected for this IADC DEC Technology Forum will discuss the acquisition and interpretation of data streams to maintain safety, reduce costs, improve drilling efficiency and manage well integrity during the well construction process. Those who wish to attend, must pre-register. To register, please visit the IADC website. The IADC Advanced Rig Technology Committee has issued a call for abstracts for the ART Spark Tank, scheduled for Wednesday, 2 August. The deadline for abstracts is Friday, 30 June. The IADC ART Spark Tank is an opportunity to provide technology entrepreneurs a new opportunity to pitch their products and ideas to a panel of drilling contractors and operators (“Sharks”). The IADC ART Committee welcomes abstracts on any new technology that will improve efficiency or safety in well construction. The purpose is to provide insights (“Sparks”) to technology developers into what matters to those they are innovating for. There is sometimes a vast disconnect between a good idea and a great product, and this series will attempt to close that gap in a good-natured, productive manner. Caveat: This forum is not designed to generate investments in the product or service. Each Spark Tank presentation should last no more than 15 minutes, which will allow the Sharks to ask questions and give feedback on just how great (or not!) they think the product is. The ART Spark Tank is designed to allow technology entrepreneurs the opportunity to pitch products or ideas to a panel of experts comprising both drilling contractors and operators. The Spark Tank is envisioned as a forum to “spark” new thinking. The Spark Tank will be moderated by an officer of the Advanced Rig Technology Committee. Format: Thirty minutes are allotted for each topic. Each presenter will have 15 minutes to speak. Please be as brief and concise as possible. Investment: The Spark Tank is not a vehicle to seek investment for an idea or products, though “order of magnitude” estimate of development cost is acceptable. Complete the form here to submit your abstract. For more information about DC, please visit www.drillingcontractor.org. The 2016 IADC Incident Statistics Report Q4 Year to Date Summary Report is now available via the IADC website. This month, we are launching the IADC Lexicon “Featured Term”. The IADC Lexicon is a compendium of upstream-related terms, which, unlike conventional glossaries, are official definitions drawn from legislation, regulation and regulatory guidance, standards (global, national and regional), and IADC guidelines. Terms often have multiple definitions from different sources. Weatherford Drlg Int’l: Rig 173 (1); Rig 776 (5); Rig 810 (2); Rig 841 (2); Rig 843 (1); Rig 871 (5).